Select a cleaning plan based on your needs and we will match you with a legal, vetted cleaner. An easy online booking system. Professional standard part time maids. Helpling doesn't operate like a typical maid agency. Instead, we're an online cleaning services platform, which connects customers to part time maids in Singapore. We offer increased flexbility, meaning that you get to determine how often you'd like your home to be cleaned and when. 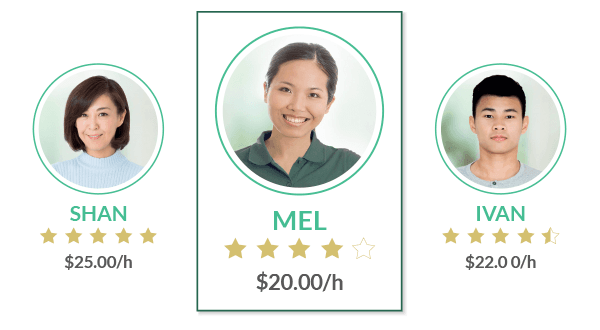 Only fully insured, background-checked, and well-trained part time maids are available for hire on our platform. Thanks to our rigorous selection process, you can be sure that you’re getting some of the best part time maids in Singapore. We guarentee that all of our part time maids meet the high standards that our customers have come to expect. When you book a part time maid online through Helpling, we'll match you with the best helper in your area based on the location of your home. If you’re especially pleased with the part time maid service you received, you can request the same part time maid during your next booking, or for your recurring bookings. Our part time maid services start from $20 per hour for a regular weekly or fortnightly cleaning and $30 per hour for a one-off clean. This price includes absolutely everything – no tipping, no hidden costs, and no surcharges. Additional services are provided at our same competitive hourly rate, so you’ll know exactly what you’ll be paying before the clean. To book additional cleaning services, simply choose the extra cleaning services you require during the booking process. As well as our general home cleaning services, our part time maids can also take care of extra cleaning tasks. There are corners of our houses that are always forgotten, with chores left on our to-do lists for many months at a time. Whether it’s cleaning your fridge, oven, interior windows, wardrobes, or doing your ironing, no-one wants to spend their free time sweeping, scrubbing, and mopping their home from top to bottom. Our part-time maids can happily take these chores off your hands, for the same transparent rates as our usual home cleaning services. Add one or all of these services to your standard part time maid service and come home to a house with every corner fresh and sparkling.